Real Madrid and Spanish defender Sergio Ramos has become quite the villain in Egypt after he injured Egyptian superstar, Mo Salah, during the 2018 UEFA Champions League Final in Kiev. 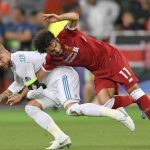 Ramos has been blamed for what many claim to be an intentional foul on the prolific Egyptian forward during the 1st half of the match which has put Salah’s World Cup appearance in doubt. Ramos who was not booked by the referee, Milorad Mazic, during the incident has faced a negative backlash from Liverpool and Egyptian supporters including an Egyptian lawyer who has decided to take the issue to court according to reports from the Daily Mail. Lawyer Bassem Wahba has filed a €1 billion (£873m/$1.2bn) lawsuit against the Real Madrid Captain following the cup final clash that saw Real Madrid lift the trophy for the 3rd consecutive time under coach Zinedine Zidane. A petition calling for Ramos’ ban has so far garnered 400,000 signatures. In a statement released by the petition organisers, Ramos was criticized for his unsportsmanship conduct. “Instead of winning matches fairly, he uses tricks that defy the spirit of the game and fair play.